(CNET) -- In less than 24 hours all full-power broadcast TV stations in the U.S. will flip a switch to stop broadcasting their analog TV signals and will only broadcast TV signals in digital. And for millions who are unprepared, it could mean lights out on their favorite TV shows. Vouchers, publicity and a June 12 deadline have pushed analog TV watchers to switch to digital. I know what you're thinking. "We've heard this before." In fact, you've probably been hearing about the transition to digital television for the last decade. You likely started seeing public service commercials last year encouraging you to buy a digital converter box to turn your old analog TV into one that could receive digital signals. In early February another supposed deadline loomed. And then it didn't happen. Congress, fearing that too many people weren't prepared, postponed the switch, and more than 6 million procrastinators were saved. "We have worked hand in hand with state and local officials, broadcasters and community groups to educate and assist millions of Americans with the transition...I want to be clear: there will not be another delay." So here we are, less than a day away from the final transition. And despite months of public service announcements and more than $2 billion spent by the U.S. government to help people prepare, millions will still face a blank screen when they hit that little power button on their TV remotes starting Friday at 12:01 a.m. The good news is that delaying the switch from February to June has given the Federal Communications Commission some time to ramp up efforts to get the public prepared. The agency has enlisted the help of dozens of groups including volunteers from AmeriCorps, civil rights groups, and even firefighters to help people purchase and install their converter boxes and antennas. Congress also kicked in additional cash, about $650 million on top of the $1.5 billion that had already been allocated for DTV readiness. The bulk of the $650 million was given to the Commerce Department to fund its voucher program. And Congress authorized $90 million of the $650 million to be used by the FCC for outreach programs. So far, the FCC has received $65.7 million of that money, and the Commerce Department has authorized another $9.65 million to help pay for call centers that are in place to address consumers' questions and concerns. The Commerce Department has been issuing $40 vouchers to help people pay for the new equipment necessary to turn their older analog TVs into ones that can receive digital TV signals. But just before the February deadline, money for the program ran dry and more than 2.5 million people were left on a waiting list for vouchers. In its most recent report to the FCC, representatives from the Commerce Department said that the program is in good shape, and there is enough money in the program to provide vouchers to all households that still need them until the final deadline of July 31. But even though most people are prepared, millions will still not have access to TV on June 12. In its final update before the June 12 deadline, Nielsen reported that 2.8 million American households, or 2.5 percent of the television market, are completely unready for the transition. As of the end of May, another 9 million homes that subscribe to cable or satellite services but that have spare television sets, in bedrooms or kitchens and that are not connected to a paid TV service, are expected to lose reception. The FCC has targeted 49 markets that it considers particularly vulnerable. These markets include New York, Los Angeles, Chicago, Philadelphia, Miami, Boston, and Dallas-Fort Worth. Aside from inner cities where many low-income people live, people living in rural areas, particularly in the West where fewer subscribe to cable and satellite services, are the least prepared for the transition, according to Nielsen's latest report. Acting Federal Communications Chairman Michael Copps has said that he is pleased and impressed by the cross-agency and volunteer group collaboration and cooperation over the past few months. "In January I feared where we were headed with this transition," he said during a recent public meeting. "But it has turned into an inspiring and enjoyable experience to see how these different agencies can work together. " He also acknowledged that many people will still face problems during the transition. "Even though we are better prepared this time," he said. "There will still be disruptions for some consumers. And candor compels us to inform viewers of these issues." Not only are some households completely unprepared, but officials also say that millions of people who have already bought converter boxes and/or antennas will still experience problems, such as poor reception. These problems may occur from improperly installed antennas or people using the wrong kind of antenna for their region. But it may also be due to the fact that digital signals travel differently through the air than analog signals. So some TV viewers who may have been able to tune in analog channels may not be able to receive digital channels. Because many TV broadcasters have already been transmitting some or all of their channels already in digital, some viewers who made the switch early and are watching digital TV should rescan their boxes. And they may need to readjust their antennas to get signals after June 12. The reason for this is because some stations will have to move some digital channels when spectrum is vacated. And some broadcasters may also be broadcasting the signals at different power levels to avoid interference. To help answer questions and deal with confused and frustrated TV viewers before and after the transition, the FCC has staffed nearly 4,000 call centers at a cost of more than $40 million. The voucher program, which provides up to two $40 coupons per household to help defray the cost of digital converter boxes, will also be extended to July 31. The switch to broadcasting in digital instead of in analog was mandated to free up wireless spectrum so that it could be used for other purposes. Digital signals use up far less spectrum than analog signals. The FCC has already auctioned off the spare spectrum in its 700MHz auction, which raised $19.6 billion for the government. This auction generated more revenue for the government than any other wireless auction the FCC has ever held. Not a bad tradeoff considering that the government spent a total of about $2 billion to help get people ready for the transition. The Bush administration spent about $1.5 billion on DTV transition preparation, and Congress allocated another $650 million when it delayed the transition in February. The move to digital TV has also proved to be a big boon for retailers, TV makers, and other consumer electronics makers. Millions of consumers have bought digital TVs, converter boxes, and antennas to prepare for the switch. The Consumer Electronics Association says that TV sales are up about 32 percent in 2009 compared to the same period in 2008, and this is despite the fact that the U.S. is in a recession. 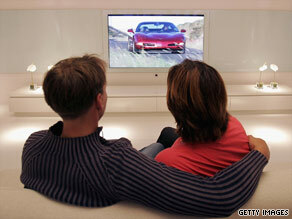 But some experts attribute the uptick in new digital TV sales to lower prices and more digital programming. Even though buying a new TV, an antenna, or a digital converter box for an older TV is a hassle and an expense, consumers also benefit from the transition to digital TV. These signals provide better picture quality. And because digital consumes less wireless spectrum when it transmits, broadcasters can offer viewers several more channels of programming. Many stations throughout the country that have already been broadcasting some or all of their signals in digital have already added channels. The FCC has also been emphasizing to consumers that if they're already subscribed to a paid TV service, they will not have to worry about the transition at all. The DTV transition applies only to full-power broadcast television stations. These are stations that use the public airwaves to transmit their programming to viewers through a broadcast antenna. That said, satellite customers who receive local stations through an antenna, rather than by satellite, may be affected. The FCC recommends checking with the provider. So in short, the vast majority of Americans are already prepared for the digital TV transition. But for the small percentage of people who are still unready, all hope is not lost. About a hundred TV stations around the country serving nearly 70 percent of all households are providing "analog nightlight" services. The "nightlight" program is a voluntary program in which TV stations agree to keep an analog signal turned on in addition to their digital signals to provide information about the DTV transition and to notify unprepared TV viewers of emergencies, such as hurricanes. More than half the stations broadcasting the "analog nightlight" service will remain on air for 30 days. And the rest will be on for at least two weeks. In total, these stations will reach 69 percent of TV households. And only high-power broadcasters are required to switch to digital, a few low-power analog stations and rural relay stations known as "translators" will still be available in some areas. The FCC and the Commerce Department also won't leave DTV laggards in the lurch after the June 12 deadline. Converter box coupons will still be available, while supplies last, until July 31. But consumers must keep in mind that the coupons expire 90 days after they are mailed, so they are urged to act quickly to redeem them. The FCC also recommends calling retailers ahead to confirm availability of coupon-eligible converter boxes on the day people go shopping. And if you're still confused and frustrated and you don' t know what to do, the FCC is also planning to provide assistance to TV viewers after June 12. In some areas the FCC will continue to offer free in-home installation services and walk-in centers to consumers who need technical assistance. These programs will be available until the end of June, and in some locations, through July. And the FCC will keep its call center available to consumers at least through the end of July for anyone who has questions. If you still need help upgrading your TV or you have questions about the availability of digital signals in your area, go to dtv.gov or call the government hot line on the transition at 1-888-CALLFCC ( 1-888-225-5322). You can also check out CNET's updated FAQ on the DTV transition for help.